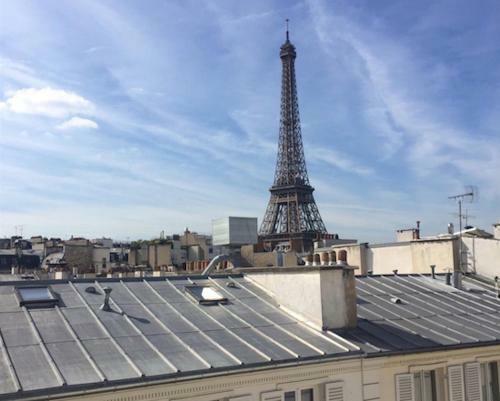 Boasting city views, Private Apartment - Rue Cler - Eiffel Tower View is an apartment around 600 metres from Eiffel Tower. The Orsay Museum is within 1.6 km of the apartment, and free WiFi is provided. Located on the 6th floor with no lift, the apartment includes a kitchen with an oven and a toaster, as well as a coffee machine. The accommodation also features a flat-screen TV and a bathroom with free toiletries. Popular points of interest near the apartment include Arc de Triomphe, Tuileries Garden and Comedie Caumartin Theatre. Paris - Orly Airport is 15 km away. Requests for late check-in are subject to confirmation from the property. This apartment has a washing machine, toaster and satellite TV. It is located on the 6th floor with no lift. Rate: € 105.00 ... € 188.76; select dates below to get current rates.